There's a story about Henry Ford which revolves around the issue of talent. One day, he hired an efficiency expert to come into his plant and make some suggestions. The man returned with a few ideas, and then he stopped and looked up. "One thing I don't understand is that fellow in the office down the hall. All he does all day is sit in his chair with his feet on his desk looking out the window, and he never does anything. Why don't you get rid of him?" Old Henry just laughed. "Him? That guy once had an idea that made me $15 million. He can sit there with his feet up all he wants." Walt Disney had his own share of idea men. He called them "story men." The wife of one of them, Joe Grant, had a baby around the time that Snow White and the Seven Dwarfs came out. Noticing that the family dog suddenly was playing second fiddle to the baby, Joe felt that would make for an interesting story idea. Walt Disney agreed, and had his people start working on the idea. 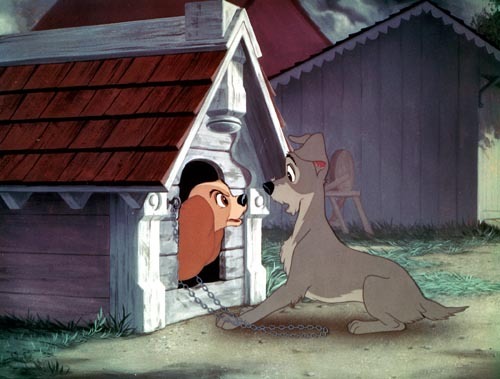 Eighteen years later, after World War II had subsided and the studio was back to normal, out came "Lady and the Tramp" (1955). Jim Dear decides that his wife Darling, who is childless, would like a new dog, so he gives her a cocker spaniel named Lady (Barbara Luddy) for Christmas 1909. 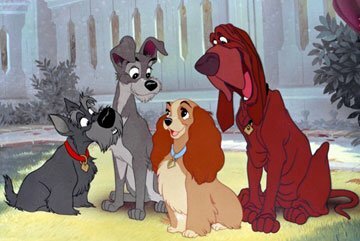 Lady grows up and becames a happy member of the household, making friends with Scottish Terrier Jock (Bill Thompson) and bloodhound Trusty (Bill Baucom) who live down the road. Things change when Darling is expecting a baby, and Lady feels neglected. 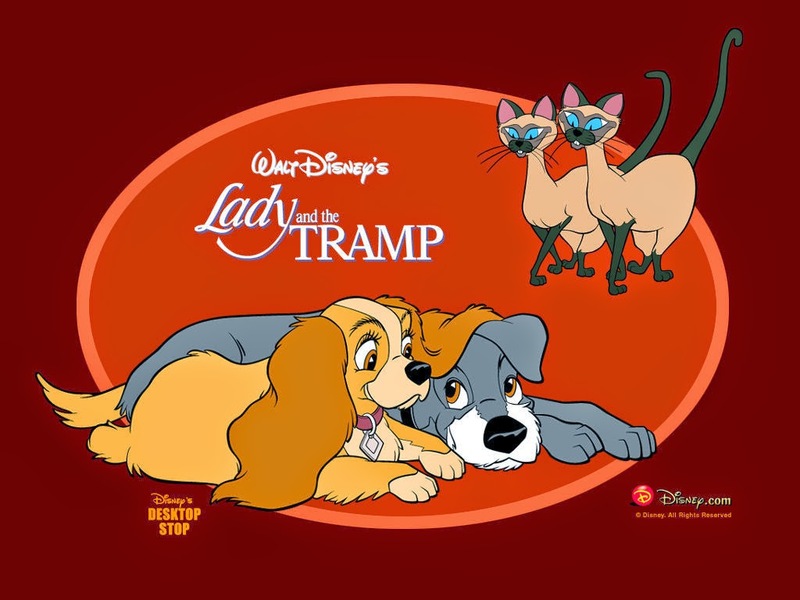 Tramp (Larry Roberts), a dog who begs for scraps from a nearby Italian restaurant, happens to be there and says he dislikes the very idea of babies, who are "Just a cute little bundle of trouble." Jock and Trusty run Tramp off, but he makes an impression on Lady. The baby arrives, and at first things are normal. However, the Dears go on a trip, with Lady and the baby left in the care of Aunt Sarah. She doesn't like dogs, and when trouble brews between Sarah's two arrogant Siamese cats and Lady, Sarah muzzles Lady. Lady runs away and is menaced by street dogs, but Tramp happens by and saves her. 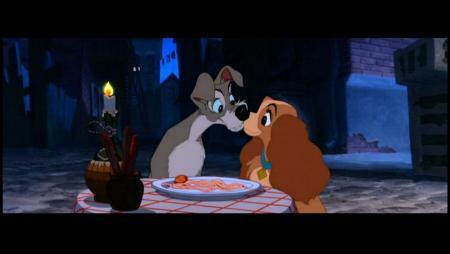 Tramp then figures out a way to get the muzzle off, and then they have a romantic Italian dinner. 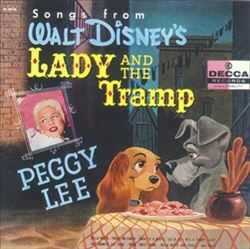 On the way home, Tramp gets into trouble, but Lady is the one caught by the dog-catcher. In the dog pound, Lady hears stories about Tramp which suggest he will never settle down. Aunt Sarah retrieves Lady and chains her to a doghouse. 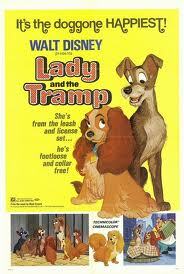 Tramp visits, but Lady is upset and Tramp, chastened, leaves. Lady later sees a rat enter the house, which could hurt the baby. She barks, but Sarah just thinks Lady is being annoying and ignores her. Tramp hears the barking and defends the baby, while Lady breaks free. Unfortunately, while Tramp kills the rat, he also breaks the crib and disturbs the baby. Not understanding the circumstances, Sarah is upset and calls the pound to take Tramp away. The Dears return, and figure out what happened. They go and retrieve Tramp, aided by Trusty's bloodhound smell. 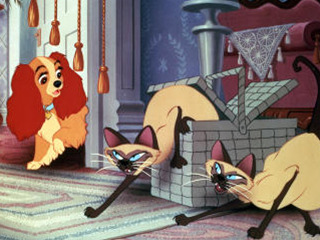 They find the dogcatcher, but will they be able to free Tramp? While an unlikely candidate for a love story, this tale of two dogs, one a pampered house dog and the other a street mutt, captures everyone's heart. 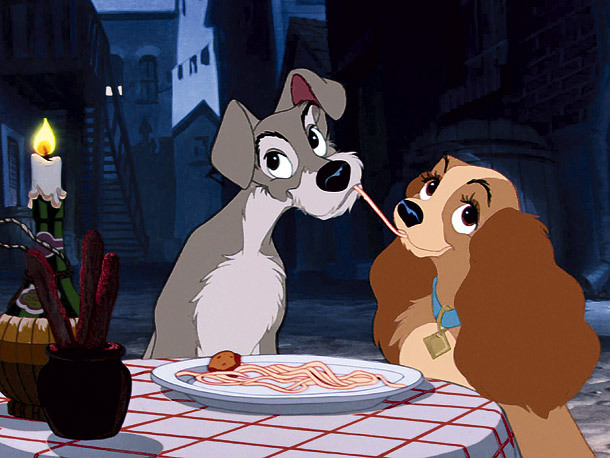 The dinner they share is famous for the scene where Lady and Tramp start eating opposite ends of the same strand of spaghetti and wind up kissing. 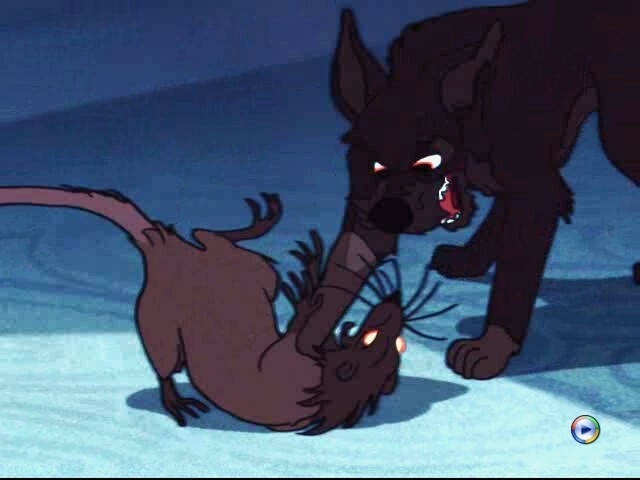 The animation is up to Disney's usual standards, but some don't think that the drogs were drawn particularly well. Another key selling point was the singing of Peggy Lee, a popular recording star at the time who wrote the songs with Sonny Burke and got very involved in all the music used. She also wound up doing some of the voices. She did a lot of promotional work, and much of the film's success and attractiveness is due to her. Another reason the film succeeded is the steady hands at the helm. 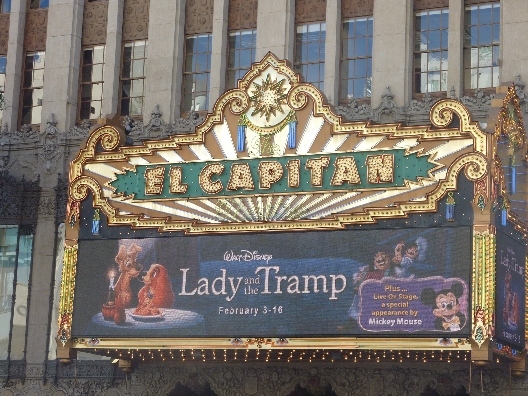 It was a period of stability for Disney Studios. 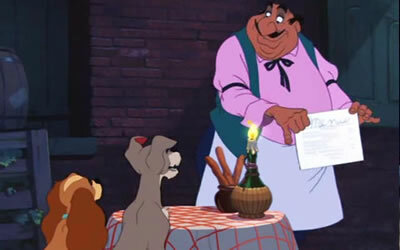 The same three men - Clyde Geronimi, Wilfred Jackson and Hamilton Luske - that directed this film also had directed the previous three Disney features: "Cinderella," "Alice in Wonderland" and "Peter Pan." Most of the original illustrators were still there as well, and the studio was able to use some of the usual voice people that it trusted: Bill Thompson, Verna Felton and The Mellomen. An interesting addition was Alan Reed, voicing Boris, one of the dogs at the pound. He must have liked his experience doing voice work, because he went on to star as Fred Flintstone five years later. This is a wonderful film for both children and adults. The children will enjoy the cute dogs running around and being playful, while adults can appreciate the budding romance between Lady and Tramp. 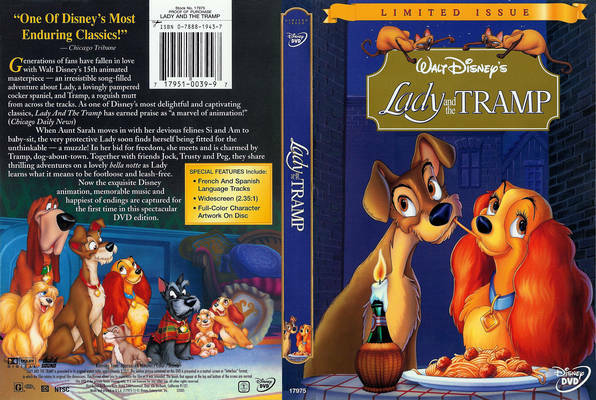 There is a lot of charm in this film, and it earned the right to a well-received sequel many years later, "Lady and the Tramp II: Scamp's Adventure" (2006). Sadly, the story took so long to develop that Joe Grant left the studio before the film's completion. He worked in a variety of other businesses, then finally returned to Disney 40 years later to work on Beauty and the Beast and the Disney Renaissance films that followed. He contributed up through "Chicken Little" in 2005, making him partly responsible for Disney's hits of the 1930, '40s, '50s, '90s and '00s. He passed away at his drawing board in the studio, a real soldier. 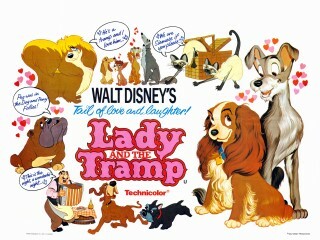 "Lady and the Tramp" remains his signature work, and the animators who took over for him repeatedly referred to his treatments. He didn't get proper credit for his inspiration that made millions of dollars for Disney until after his death, in a 2006 behind-the-scenes film included with a DVD release. 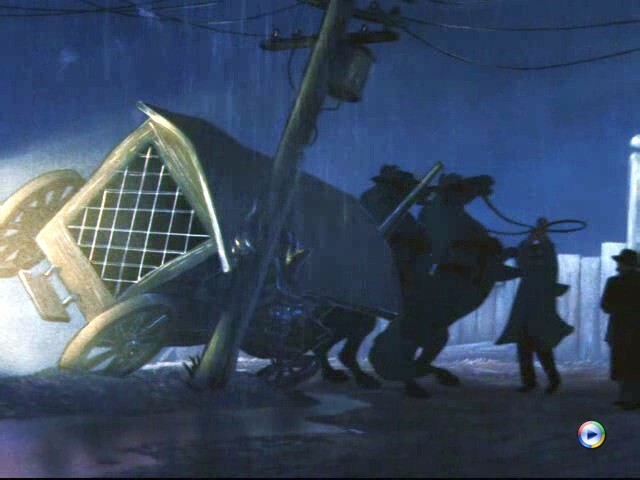 Almost all ideas for major animation features come from ancient fairy tales or more recent fantasy novels, so Joe's accomplishment in coming up with something brand new with 'Lady and the Tramp" is truly epic. This is a fun film for everyone. The soundtrack isn't bad, either. It also was the first animated film made in glorious CinemaScope, so it fits well on modern wide-screen televisions. The film is a true pleasure to watch and a great addition to any film library. Below is the original trailer, and below that the famous restaurant kissing scene.